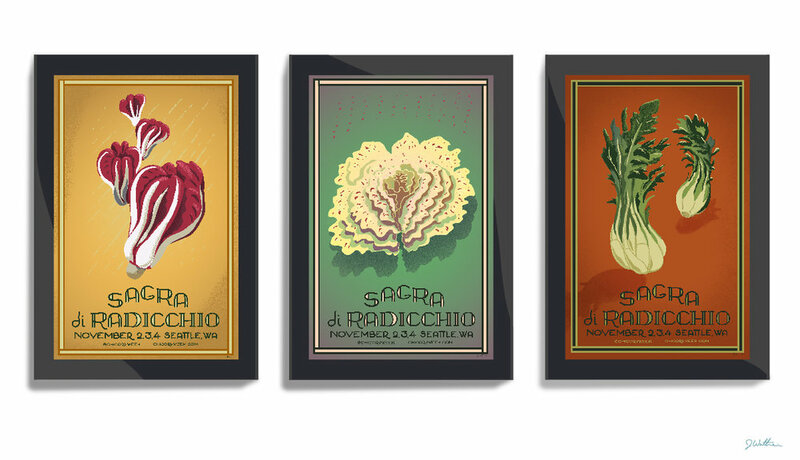 As the poster designer, my brief was this: create a poster series that celebrates, the unique colors and styles of the radicchio, and make it seem like they’re having fun! With the idea of a classic Italian Sagra on my mind, and hoping to take my cue from the vintage food posters of the early 20th Century, I turned to Leonetto Cappiello. You may not recognize his name, but I’m sure you’ve seen his posters. He’s the maker of all those wonderful beverage poster advertisements, like Vermouth and Campari. One of his trademarks is some sort of dancing nymph or jester, dancing and laughing. That’s when I got the idea of a chicory ballet! 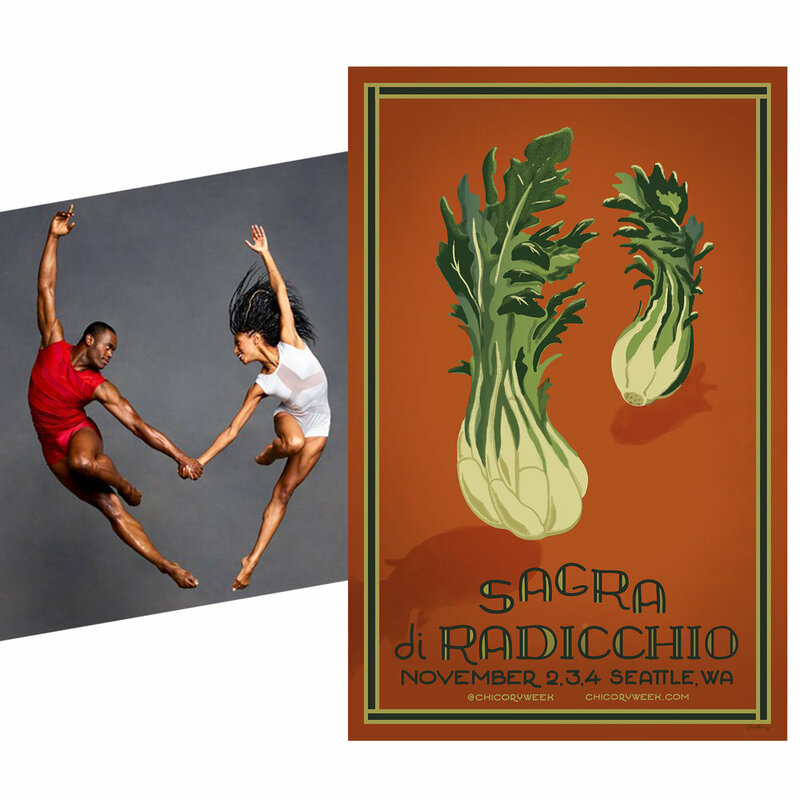 The wonderful colors and shapes of the produce will be dancing and posing, celebrating their introduction and rebirth here in Seattle. Beautiful and classical was what I wanted. The complementary colors, greens, yellow, reds all contribute to a festive atmosphere. In the slide show, you’ll see what my prime point of inspiration was, and of course the final. One of the original points of the VGoT poster project was to deliver messages to the home and community that contrasted the messages of food marketers, and asked us to imagine a future where we're more in-touch with what we consume. This is just a hunch, but I believe here in this post-scarcity world, us humans are still better adjusted when we participate in our own support. Even doing or making small things, because there are recipes and projects that we want to bring with us into the future. At least, that's some of the motivational thinking behind this new line of VGoT posters I'm calling the House-Hold Posters Series. I'm so very happy with how these turned out. 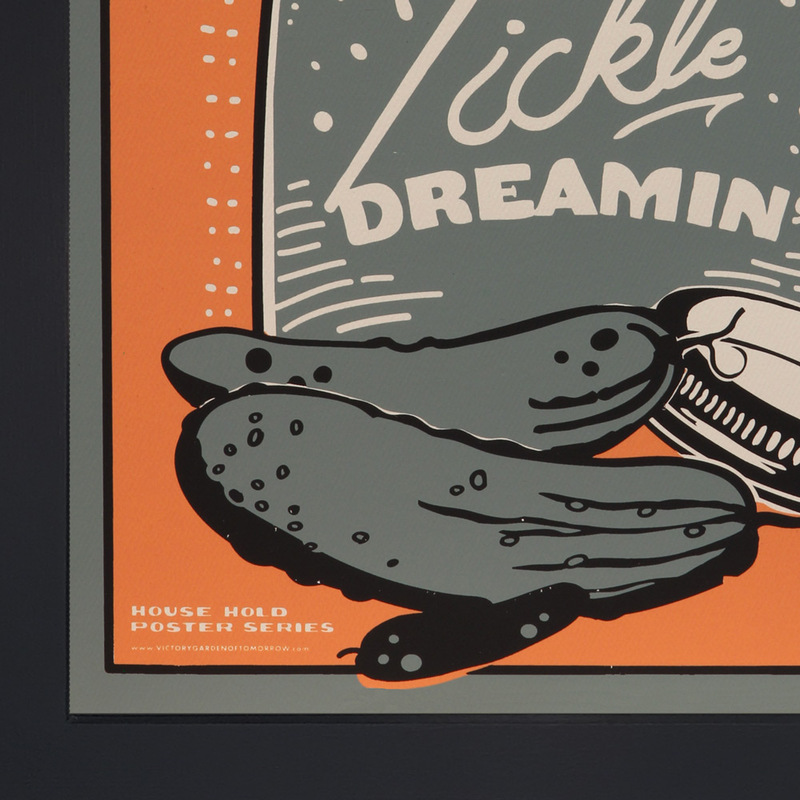 Too bad there are only 100 each of the Set the Table (12x18) and Pickle Dreamin' (11x14). Each one is signed and numbered. There are a few Artists' Proofs that I may make available later. If you would be interested in one of those, feel free to email me. I don't think these will last very long--so if these appeal to you, I recommend getting one sooner than later! This Project is Ten Years Old! It was the summer of 2008 and I decided to visit a new website some friends were talking about. It was way better than Ebay and essentially gave me the tools to start a small business. I'm talking about Etsy, and still today its a cornerstone of my design studio business. But that started the awesome journey, and now ten years later, here I am, still doing what I love. Honestly, I only recently felt like I know what I'm doing. That's the result of a thousand mistakes/lessons. I've been on lot's of deadend roads; I've learned whole new fields of expertise (sales, bookkeeping, etc. ); and learned that I need to be ready to learn pretty much constantly. I feel really good right now. I mean, I feel I have better handles on the message of the VGoT project, and better skills to produce them. There's some really neat organizing going on this year. We're making some sub-projects, like the Garden Signs, that will have some of there own labeling. There are a couple more coming, such as, "House Hold Posters," and the "Service Outfit" for community support posters. All of that and more will be rolling out this year, and in that way, I celebrate Ten Years with "More Production!" I guess there's a bit less hair since 2008, too. Right from the beginning, the VGoT was all about raising up our confidence, creating urgency to make America healthier, more positive place. Today, more than ever, that is exactly what we need. Looking back to 2007, when I began making the first posters for the VGoT, my feeling then was one of uncertainty, even fear. For whatever reason--some personal need I suppose--I wanted to make my community feel confident. I wanted to reduce their anxieties, and encourage them to be healthier. With 2008's election, we had a friend in the White House. The ground was made ready and we started to feel better, and treated ourselves better. Farmers markets took off, school gardens grew, lots of people now keep chickens, and children are becoming familiar with the garden and kitchen. None of that is lost, but it is time to once again find our people power, our homemade power, and get a new sense of urgency if we still want to make gains in public health. The 21st century still beckons us, still calls out to us to keep building the home of tomorrow. Now available, my new Utility Tote Bag is a handcrafted item made right here in my studio. Growing up, my mom was often sewing--whether fixing something old or making something new, she kept busy. I wanted to pay tribute to my mother's craft by creating my own project. What came to mind was a better grocery tote, not a wimpy-floppy thing; something stand-up sturdy and hardworking, as well as neat and interesting. I chose materials I admire, like work-wear sturdy canvas, and hardware details that are beautiful, like copper rivets. And finally I would embellish the bag with a screen print. After many trials, this is what I settled on. Roughly the size of a normal grocery bag, just a little bigger, and, of course, with a strong handle that's a wide 2-inches, making it easy on the shoulder, because this tote slides and cinches to become a shoulder bag. I've been field testing them for several months. Lots of grocery and farmers market trips where I really overloaded it. Several camping trips where it served as food bag, and later as tool bag. It has personally become my new favorite thing. It felt like a heap of work earlier this year (and it still kind of is), but now there is so much new and interesting things coming out of the VGoT project this summer. 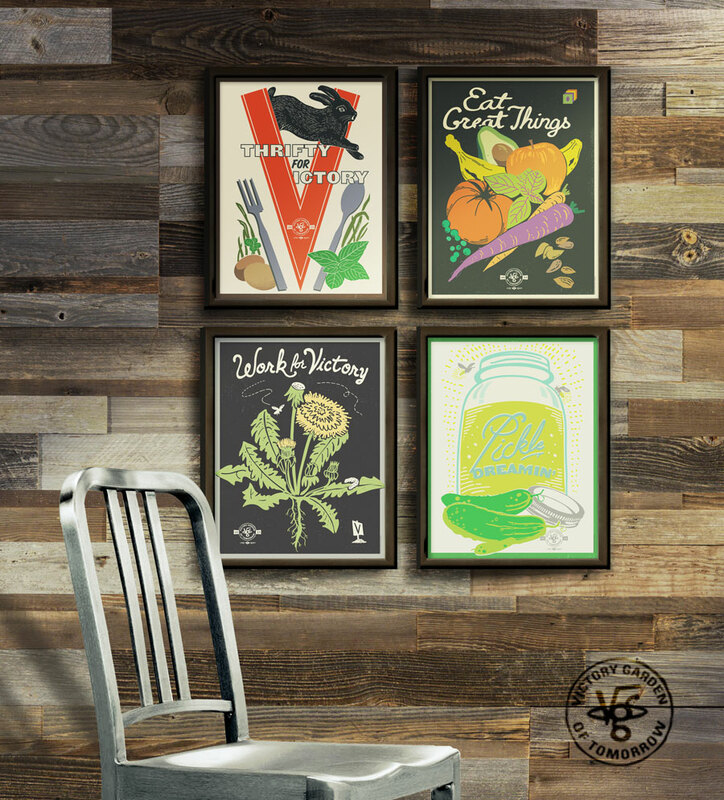 New screen print posters are a hit, and I can see why: they embody the lasting courage and very real shift Americans are making toward more fresh foods, staying more in touch with plants, and coming together over food. I call them my "Flagship Series". The "Flagship" limited edition screen print series. The 2017 Calendar "Action Snack" listed today, and I'm so proud of the styling on this one--its to become a real classic. 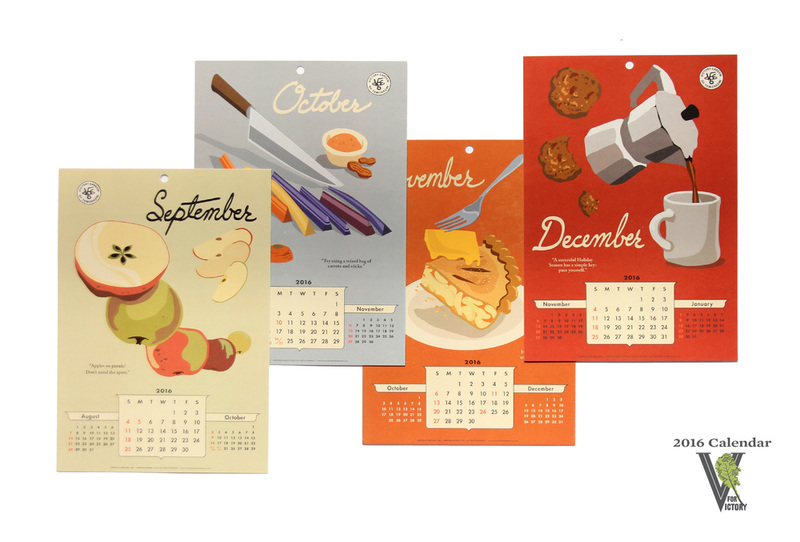 It features illustrations of my favorite snack foods in a dynamic, colorful presentation. These colors and subjects speak to the mood and feelings of the seasons. Thank you for following my work with the VGoT poster series. I love making posters because they are graphic art at it's most expressive and evocative. Posters can be made loud and demanding; or poised powerfully for quiet strength. Within a vertical rectangle, a poster can tell you what to do, or better yet, show you what you can do. Like a song on the radio, it should be interpreted metaphorically. 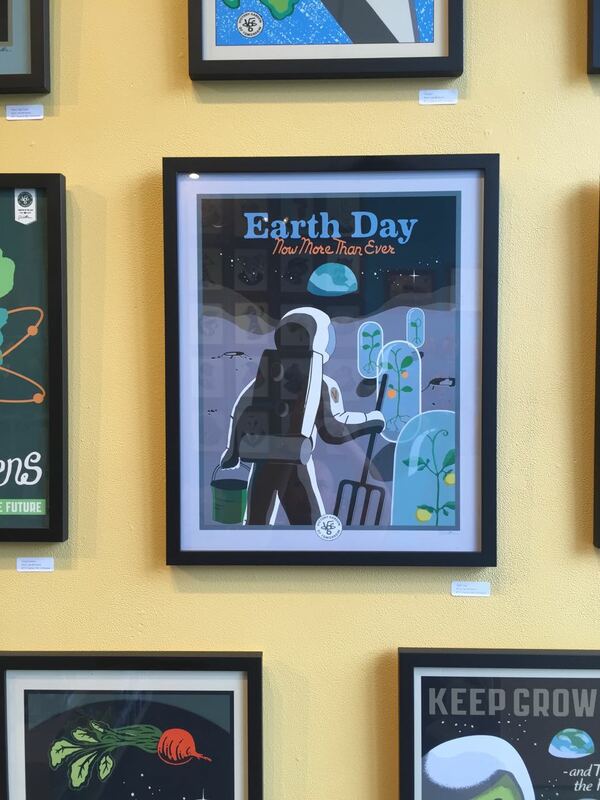 Illustrated posters still have a role to play for us modern Americans. I'm still excited when I get asked to make posters available for a community group. 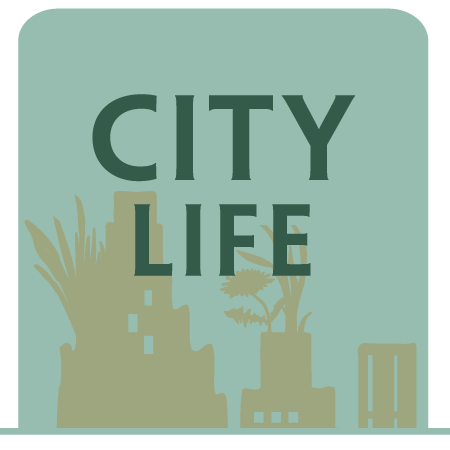 I hear from food pantry folks, and garden education folks. They all want to give an imaginative voice to their program, and I’m flattered that my illustrations connect with the energy of their real work in the community. From abstract to concrete-- I love it. I'm currently reforming the VGoT. It's a project I can't get away from, nor do I want to. But it’s not quite what I wanted it to be. It should be more beautiful, more like a real classic item. It should lend itself to other unique goods that express quality, durability and beauty. That’s why I’ve begun sewing heavy grocery totes and printing on them; as well as fabricating my own wooden poster frames. I want more screen printing, which I’ve always loved—there’s nothing like real ink on paper or fabric. I hope to have these new items ready to share this summer. Those little jolts of excitement, which propel me to the sketchbook, are coming more frequently now. The hard part is doing the weeding; that is, keeping what’s worth pursuing and tossing what should go to the compost. The thing I crave these days is a project which has an attractive neatness, expressive quality, and is proudly made in the USA. I want posters with a voice that is powerful and imaginative. Its coming along. Thank you for staying with me! I promise to reward you with some first looks and special offers coming over the next few months. I'm very excited to present a new line of work this year that focuses on food and cooking. Why? Because that's where the action is! And I know because this year has seen me in the kitchen a lot more than usual. With my wife doing Teacher Education (she's going to be an Elementary School Teacher), that left me doing all the kitchen duty. I love to cook, but when you're busy the favorite things are the simple things! Last year, the focus was on an active, strong voice to promote feelings of change ("Courage & Progress"). Now with this year's interest in cooking with fresh foods, I want to express my wonder with the simplest pleasures of food, and generally promote interest around cooking fresh foods at home. So my first project with this in mind is the new 2016 Calendar "Action Snack." I love simple things, almost like stuff kids eat these days. Tomato, avocado and salami on a cracker, for example. That one is actually something my wife and I call "camping sushi." Or oatmeal and raisins, or the cut apples which I eat probably everyday, and the rainbow carrots. My sense of wonder and awe is communicated by putting a little movement in each month's design; a feeling of weightlessness, like floating. Imagine watching cheese and a peice of apple pie falling in slow-motion onto a plate. Many of these are my comfort foods, feel-good foods. I like how I feel when I eat stuff like this. The sense of color was important. At first, I wasn't sure about doing full flood colors on each page but then I realized you need that attitude, that strong statement to make the proper feeling happen; a feeling that I associate with the months of the year. I'm feeling like this project will be setting the style & tone for the 2016 edition, and I can't wait to get started. As I learn more about organic produce, the more I like it. There was a time when I thought "oh, geez, here's another way for the grocery to charge more for produce." But after getting to know the folks at OEFFA (Ohio Ecological Food and Farm Association) I realized organic means more than just "no spray". It represents a holistic set of farming practices that protect the land, the people, and even the wildlife. I'll have more about this issue later this year, but in the meantime I'm very excited to present this new poster for Organics: Today's Victory Vegetables. This summer I've become more interested in cooking and preparing better meals. Making food at home is just inherently healthier, it seems to me. So I decided to create a few prints that may inspire a bit more home-cooking. For this mid-year Edition I was thinking about the practice of making stock chicken broth from a roasted chicken-- one of my favorite and economical practices. We do this and use the broth for all kinds of recipes, like rice or noodle soups. And cabbage is both nutritious and versatile, showing up in cuisines around the world. I got up early this morning and had the pleasure of doing some thoughtful re-reading, over coffee, of "The Omnivore's Dilemma," Michael Pollan's classic exploration of American food ways. Part technical, part philosophical, his story informed so many of my views on food and home cooking; it was nice to review that today. It was like checking in with myself and where the VGoT project is going. Pollan's visionary book came out in 2007, and here we are in 2015, still wondering about the value versus cost of organics, the proper role of processed and packaged foods, whether or not Whole Foods supermarkets are a boon or a scourge. And that was the thing that jumped out at me: big organic versus the local organic. I generally take a broader view that is happy that we're discussing the kind of organic we want at all. But if big organic can serve more people who ordinarily wouldn't go to a food coop or a farmers market, then I say that's a win. And remember, organic is always GMO-free. Overall, I have to say I'm optimistic and encouraged by the changes that have taken place over the last ten years in the food culture of America. So much is up for discussion these days that was considered fringe thinking ten years ago. Consider school lunches and school gardens, or even industrial food makers who are dropping unnatural additives. I'm not declaring "victory! ", but I'm encouraged. Change takes time, but it's moving. I'm excited by all the people who are interested in cooking more, refocusing on real family meals, or tinkering in the vegetable garden. Thanks again, Pollan, for articulating those complex issues so well. And now, as a guy who draws pictures about food, I'm wondering, what's next? Old dog-eared copy of one of my favorite book. For all these years making VGoT posters, I've been working under these banners: Garden, Kitchen, City, and Explorers. These places have been inspiration points in the diverse place I call "The Victory Garden of Tomorrow". Each Collection is a work in progress, to be added to as inspiration comes and designs are created. Its been my pleasure since 2009 to make quality, bold graphic goods available to collectors, advocates, gardeners, teachers and lots more folks. Now, I hope the clarity will help everyone find what they're interested in. Next month, I'm having a show of new work at Screaming Sky Gallery, a fun and interesting shop in Portland's Alberta Arts District (March 26-April 27, 2015). The show is all about the "Explorer's Collection" and the Space-Age Gardener. I'm very excited to finally have an excuse to expand that collection. Preview of my New Garden Signs. These weather-proof durable gems are similar to, but better than, those old-time 1940's proud gardeners used to plant in there plots. Available soon! As I write this, I'm practically knee-deep in to-do lists, inventory, shipping boxes, sketches, notes, receipts, and a bunch of other debris of a growing business. Yes, I'm growing my business in 2015 and its all growing pains now. Sure, I'm excited. A lot of my new things coming down the road have been on my mind for years. 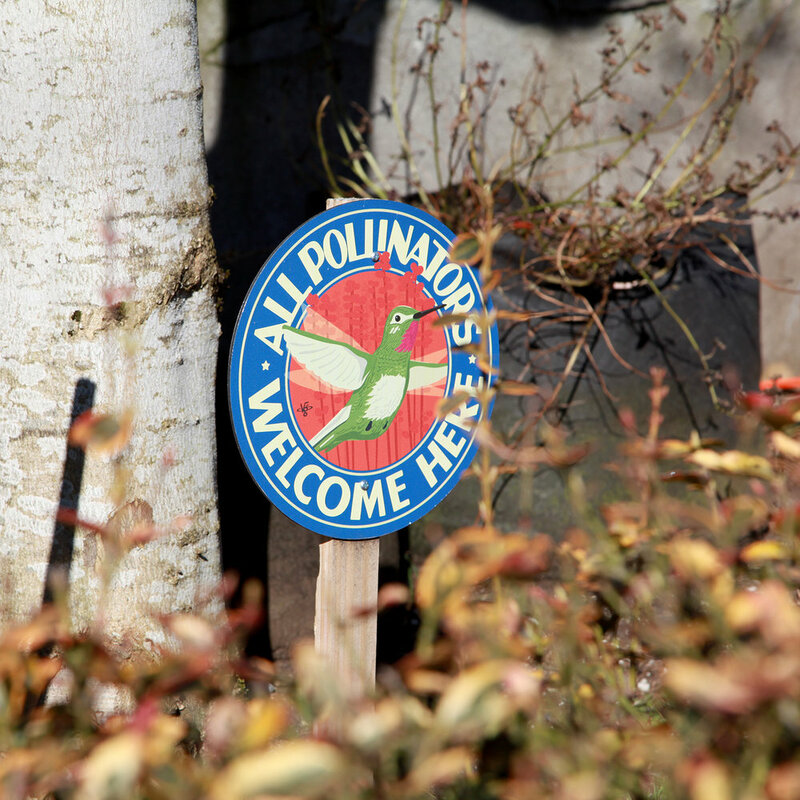 For example, making outdoor-quality garden signs has been a back-burner project held up until I could muster enough financing to make a decent batch. After this past Holiday sales season, I'm finally in a place to do just that. Also, Greeting Cards and other stationary has been one of those wish-list items that needed extra resources. This, I'm sure, will be my year. 2015 is a year where I'm not going overseas, like I did with my then-fiancé in 2012-2013 to teach english in South Korea. Nor am I getting married this year, which took over a lot of 2014! (but what an amazing time :-) And finally I'm not sharing a small studio space, and I'm moved into a decent-sized workplace where I can grow and build. Yes, it is exciting! Now, I'm working on focusing by clearing out client commitments, and declining big projects. Not this year! Its all about creating and building my own line of graphic-goods that has a tremendous potential, I think. Invent something and sell it, is what a mentor once said to me, and I'm taking the advice to heart. So now the show is going on the road. First, to the Northwest Flower and Garden Show in Seattle. I'm excited because its a big show right in my favorite territory. These folks "get" what I do and are going to be excited to see my new stuff. Right now, pre-show, I'm pretty exhausted from all the designing I've been doing, and yet there's still a show booth that needs built! Through it all, I enjoy the independence. Its important to me. Although, I'm taking a big chance, financially, I feels its worth it. At least, I feel I can say that now at the beginning of the year. Lets see what happens and I'll let get back to you whether it pays off. Wish me luck! First poster designs for 2015 are rolling out and I'm fairly proud of what we have. It's been a hard several months, but I'm pleased with the results. As usual, I wanted to focus on food and one thing that inspired me was the USDA's (and Harvard's) Eating Plate. Here the recommendation is that veggies and fruit are half of what you eat everyday. After working with teens earlier this year and seeing what they ate, I know that's a longshot! So here's some work to stimulate the appetite. Another theme I dwelled on was the idea of luck. I'm not a superstitious person, but darn it if there doesn't seem to be an "x" factor in things that happen. Even if you believe in making your own luck, which I do, you still believe in luck. That's why several of my new pieces include a lucky charm, just in case. I'm especially excited to release my "Lucky Gardener's" Bandana to wipe your sweat after making all that luck (coming later this month). Which brings me to another theme for this year: work. Passive consumerism won't be enough to help us eat better; we need to get our hands dirty in the yard and the kitchen. It's like what cooking advocate Mark Bittman writes: "Do it yourself. . . Our goal should be to make things better, not to accept such a dismal status quo." 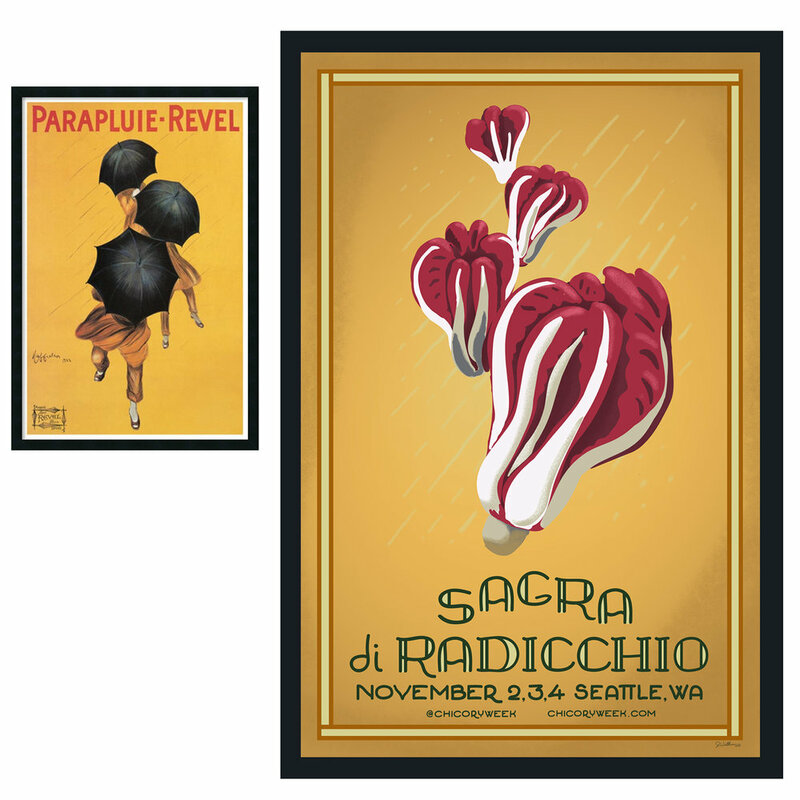 To spread the word, I've created a line of "collectible quality" posters and usable goods. High quality has always been a bottom line whenever I make something. 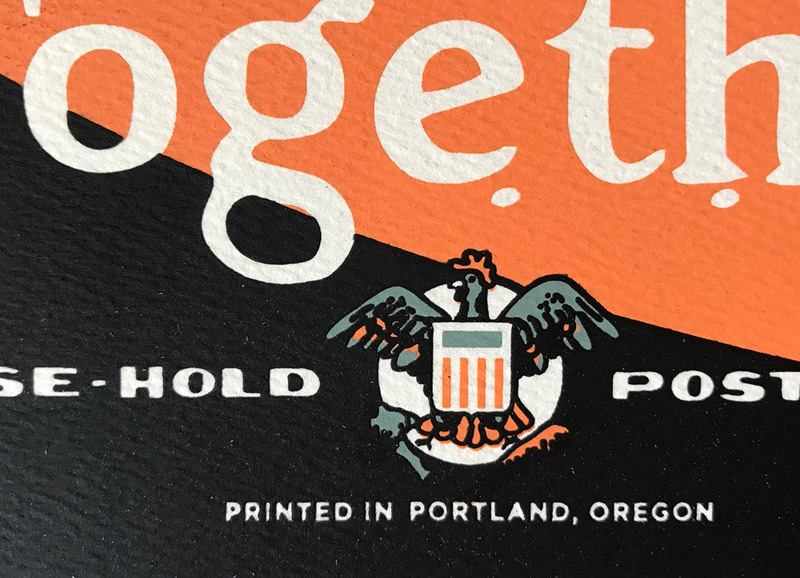 This year's crop of graphic goods are all made durable and with integrity here in the USA, most of it here in Portland. New floursack towels look better than ever. Bandanas are coming soon. Lettercards, or rather, blank greeting cards come as a box-set and look amazing. These are things that make for interesting gifts for families, teachers, gardeners and all those working to change the world. Explore the collection and see what's new from the VGoT. Stay in touch: be sure to get my occasional email for specials and announcements. And follow me on Facebook. Here are a couple of shots from "behind the scenes". I do a lot of mocking up and sketching. Two new designs, "Thrifty for Victory" and "Pickel Dreamin' " have more color and style than any towel print I've made before. Putting together the new "Lettercards" was quite a process. Creating the flap-fold box was a new challenge for me and I ended up making a bunch of prototypes before getting it right. There's more to a floursack! I wanted to express that in these new hangtags. Japanese traditonalists use fabrics like these to carry items like jars, bottles, leftovers, eggs. The new tags have instructions for folding these handy carriers.